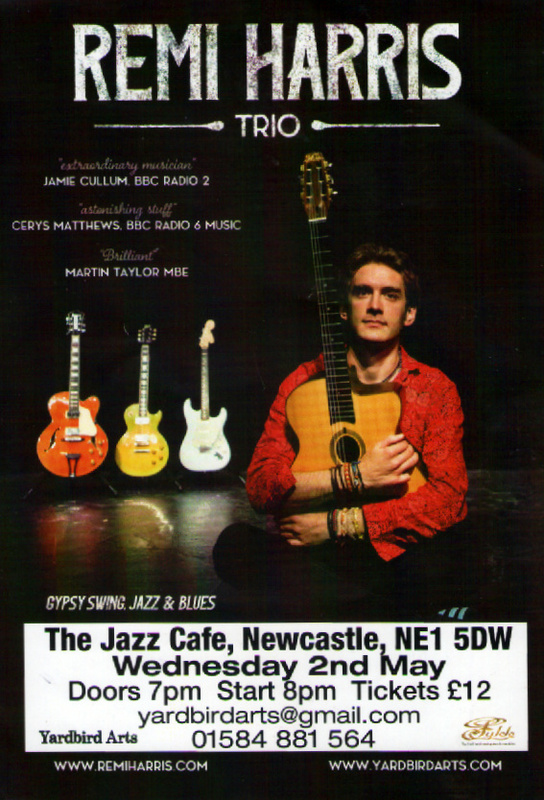 This Wednesday (May 2nd) there is a long overdue appearance on Tyneside by the astonishingly talented guitarist Remi Harris. Largely self-taught, Worcestershire based Harris is just about at the halfway point of a lengthy tour of Britain and Ireland. The ‘Gypsy jazz’ or ‘Hot Club’ label is all too easy to append to Harris but there is more to him than that. Harris is indeed a fine exponent of all things ‘Hot Club’ and he’s got the ‘been there, done that’ t-shirt from Samois sur Seine. Countless concerts throughout Britain, a spot at the Montreal Jazz Festival, a long haul trip to Australia, CDs, radio and television appearances, Remi Harris has an impressive CV, all this before turning thirty! At the age of seven Remi’s father helped him learn the rudiments and, in a few short years, he was playing gigs with school mates The Beatles were an early influence, similarly Chuck Berry and Jimi Hendrix. In his late teens, jazz grabbed Remi’s attention and by the age of 22 was able to give up a part-time job in a music shop, since when he’s made a living playing guitar. Year after year Remi is highly placed in the British Jazz Awards’ polls and his affinity with the great jazz guitarists - Django, Joe Pass, Wes Montgomery - makes him an attractive proposition for promoters and accessible to audiences wherever he goes. Remi started his 2018 tour on home ground at Yardbird Arts Club in Eardiston, Worcestershire and will draw to a close in June in Ireland. Don’t miss this opportunity to hear Remi Harris in concert at Newcastle’s Jazz Café this Wednesday, May 2. Remi will be joined by ace rhythm guitarist Caley Groves and long-time musical associate, bassist Mike Green. It’s an eight o’clock start with doors at seven. Admission on the door is £12. It’s about time we Tynesiders got the opportunity to hear Remi Harris on our doorstep. This is it, let’s take it. The Remi Harris album - In On The 2 - was one of my 'CDs of the Year' in 2017. Highly recommended.